For a dipping sauce, we mixed together equal parts dijon mustard and coconut aminos/tamari. You can also add a little chili oil or Sriracha if you like it hot! Prepare the filling by heating the oil in a medium sauté pan over medium heat. Add chicken and cook until lightly browned and cooked all the way through. Add mushrooms, water chestnuts, green onions, ginger, and garlic. Cook until fragrant and cooked through. Add 4 Tbsp coconut aminos or tamari and stir to coat chicken mixture. 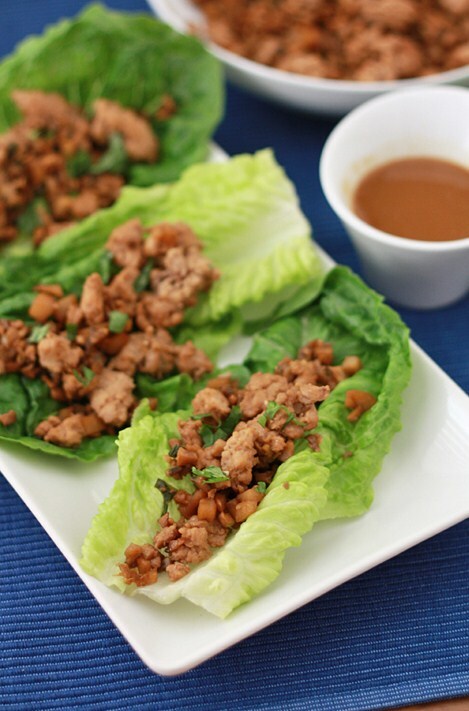 Add additional sauce as desired (remember you don’t want it too wet, or it will make eating your lettuce wraps a very messy, soggy experience). Scoop mixture onto lettuce leaves. top with cilantro, if desired, and your favorite dipping sauce.